Developed nations now consume an estimated 16 tons of minerals, ores, fossil fuels, and biomass per capita every year, meaning that we are consuming Earth’s resources at an entirely unsustainable rate. Though this may seem a daunting fact, you can make a difference in your Sussex home by joining the 94% of residents in the South East that have already committed to making positive changes to lead a greener lifestyle. Doing so could have a worthwhile impact on your household’s pocket as well as its sustainability! Here are some changes you can enact at home. By now we all know of small ways to save energy around the house, like switching appliances off when they’re not in use rather than leaving them on standby. Yet your appliances can contribute to sustainable living when in use, too, especially in the case of dishwashers. Though it might surprise you, a full load in a high quality dishwasher with eco-friendly settings is more water and energy efficient (and cheaper) than washing up by hand. Additionally, appliances such as fridges and televisions with high efficiency ratings typically require at least 20% less energy, making them an excellent investment for yourself and the environment. Reduce, Reuse, Recycle – oh and not fogetting Repair and Refill! It’s a mantra for green living that we’ve all heard many times before, but it’s becoming more relevant than ever. Horsham District Council recovers 14 tonnes of litter and flytipped waste every month while national recycling rates have fallen in recent years. While it certainly helps to be vigilant in your recycling habits, it’s even better to reduce your waste and finding ways to reuse and repair items you might otherwise throw away. Visit the Horsham Repair Cafe on the first Saturday of every month for all manner of repairs, refills, and remake ideas. 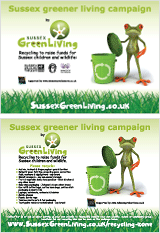 Sussex Green Living offer a single-use plastic recycling scheme too, learn more here. The practice of reduce, reuse, and recycle isn’t just for your rubbish bin; applying to the contents of your wardrobe can make an enormous impact on living a greener life. The clothing industry is one of the largest consumers of resources, using over 10,000 litres of water to make one pair of jeans. You can take huge strides towards sustainable living by repairing and remaking your clothes, you can learn the art at the Horsham Repair Cafe. Repurposing old clothing and dedicating to only shopping in the excellent range of vintage and charity shops throughout Sussex. Donating your unwanted textiles to the award-winning Bags of Support will ensure that your old clothes will support the community and be ethically recycled rather than going to landfill. The sheer scale at which the world is consuming resources may seem intimidating, but we can enact meaningful change on a domestic level by making our own households more sustainable. Your purse as well as the planet will certainly thank you! This entry was posted in Climate change, Green stats, facts & news, Green Suppliers. Bookmark the permalink.